It was not a good week for language learning. By which I mean that if my linguistic ability was the average for mankind, the wheel would have been invented 7,000 times since nobody would have been able to share their discovery. You know that feeling where you begin a test filled with certainty that the 100%, A-grade, best-student-ever, candidate for lord-and-master was in the bag? Only to be faced with soul crushing defeat of only one correct answer out of five, thereby proving every local 2 year old your superior? No? Then let this be a lesson in humility whereby you never admit this to my poor broken soul. This morning I was late for my Japanese class. Admittedly, it was not by much: My class started at 8:45 am and I arrived in the foyer of the International Student Centre a few minutes later. However, it was enough to find the tables and comfy chairs that decked the lobby area completely devoid of student loafers. Since the day had already become warm, I paused briefly at a drinks machine to buy a bottle of water. Drinks machines are everywhere. Everywhere. 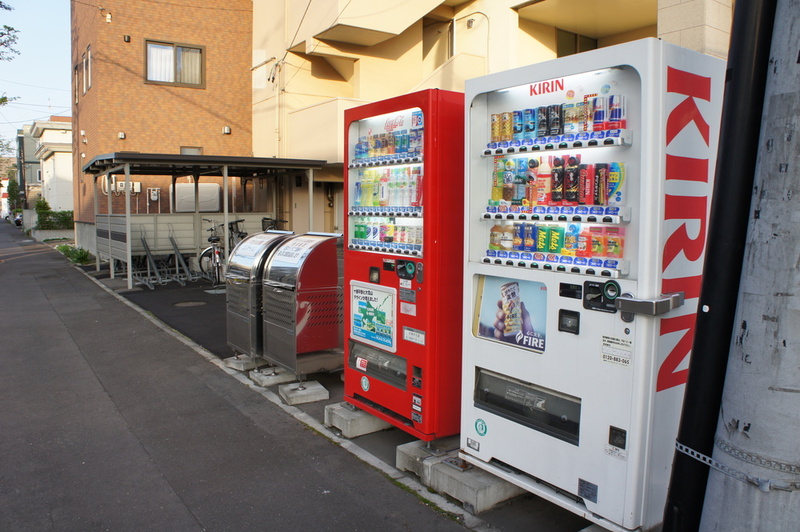 One great thing about Japan: there are always drinks machines. Everywhere. I then turned about and zipped up the stairs to the third floor. I had only walked a few steps towards my classroom when another student intercepted me in the hallway. "You're in 'Kanji II'?" he confirmed. "There's no one there." No one? I glanced in the nearest classroom. It was packed full of students staring somewhat desultory at the papers being handed to them by their teacher. It reminded me that we too, were due to get our mid-term results back that day. It also told me that today was not intentionally a holiday. Walking down to our classroom door I stuck my head inside and confirmed what I had just been informed; it was as barren as an open invite party entitled '101 photos of my gangrenous toe nails'. "Was our lesson cancelled?" I asked uncertainly. I didn't remember this being previously mentioned but that didn't necessary preclude the possibility; our classes are conducted purely in Japanese and my verbal skills can be politely referred to as 'rudimentary'. By now, the class should have started about 10 minutes ago so someone ought to have turned up. "Maybe our mid-terms were so bad..." I began. "That everyone knew it would be better to never come here again." Denial. This class never existed. No one was ever taught any Kanji characters. If you're in doubt of that fact, there is proof somewhere in the staffroom. Just as I was about to suggest we went back down to the lobby and checked the notice board, our teacher appeared striding down the hall way towards us. She looked at her two lonely waifs and then in at the empty classroom. Then the doors of the elevator slid open, revealing our entire class. The chances of that happening are disturbingly low. I'm declaring it a conspiracy aimed at creeping me out. It won't work. My mid-term result was fine and I'm staying with all you people no matter how long you choose to hide in elevators.